Design language is ... overarching scheme or style that guides the design of a complement of products ... which can describe choices for design aspects such as materials, colour schemes, shapes, patterns, textures, or layouts. In the case of the new MacBook from Apple, the design language is wireless usage: AirPrint, AirDrop and AirPlay and Bluetooth. And what I found, curiously enough, is that my new Space Gray MacBook really was talking to me in a very distinct way. There's a reason. "Our vision for the future of the notebook is one without wires." Guess what? You aren't going to muck around your desk looking for a wired mouse! How about that BT Magic Mouse? I'd like that. I guess this was my emotional, anthropomorphized reaction to a new product. Instead of feeling frustrated that I couldn't behave in old ways, the MacBook was urging me on, via its design language. It wants to behave differently, and I felt that familiar tug of being pulled into the future. Just like I always have when Apple foresakes the past. Of course, one reaction might have been frustration. Longing for a full featured dock. 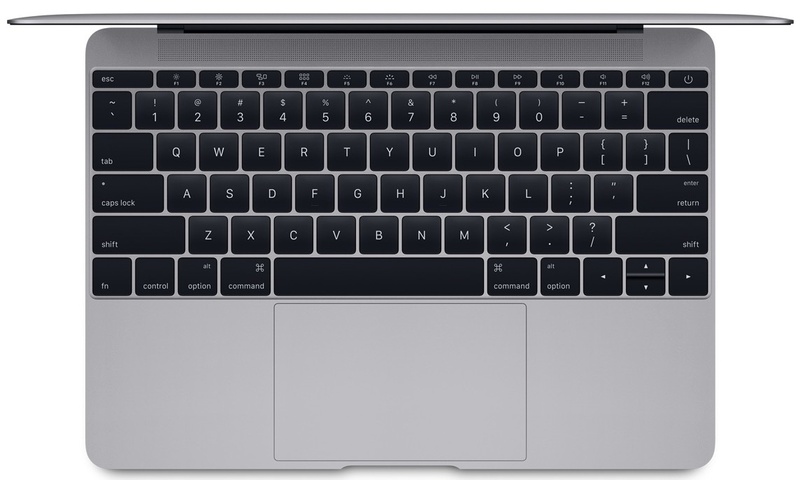 Wanting to make the MacBook, by force of will, behave like my old 2011 MacBook Air. There will probably be many articles that explain how to think and work in the old ways. But I didn't feel the need to do that. Instead, I started thinking about how I would approach and use this new Macintosh. That led me to asking the next key question. How would the new technologies touted by Apple really work for me? So I started exploring each of those Yosemite technologies to see how they'd work in practice. 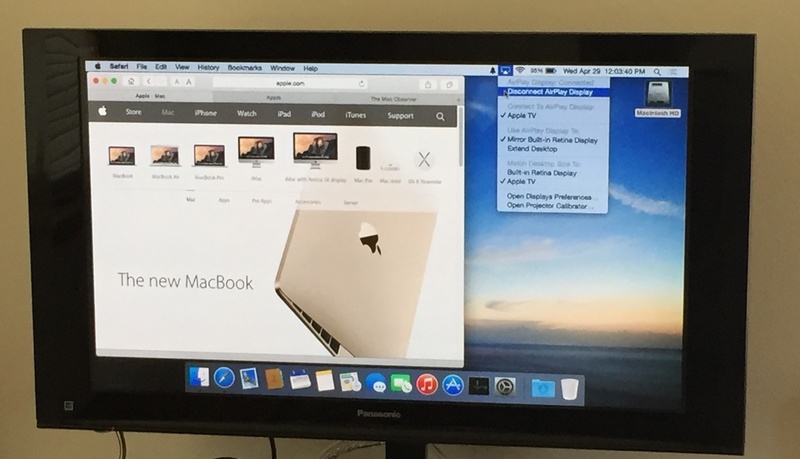 I have an Apple TV, and so it wasn't hard to go into System Preferences > Displays and turn AirPlay on. In an instant, I had my MacBook's display on the big flat screen. AirPlay is not something new for the MacBook; it's a Yosemite thing. Having never used it much, I was pleased to see how simple it really is. If you have a big display with an HDMI input, the Apple TV is a sweet ($69) alternative to an expensive USB-C to HDMI cable ($79). 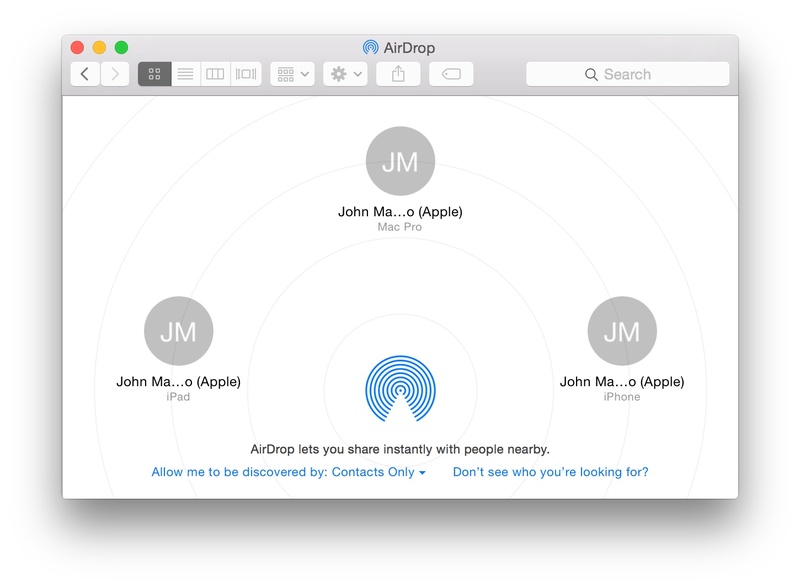 I've been using AirDrop, such as it has been, ever since I started working with the Yosemite beta last year. It was never very reliable. However, with OS X 10.10.3 and iOS 8.3, AirDrop has finally, for me, come of age. It's the fastest, easiest way to move files to and from the MacBook. Just in time for the MacBook: AIrDrop working fine. I don't have an AirPrint enabled printer, but I have always been able to share my HP OfficeJet 4500 with the Printopia utility and OS X Printer Sharing. Somewhere along the way, that seems to have broken, and so I couldn't do a sample print from the MacBook. It's may be due to the fact that the Mac to which the printer is connected is running Mavericks. Or the HP printer driver may be the weak link in my chain. But I have no doubt that a proper AirPrint printer would work. Moving on. When I bought the MacBook, I ordered the USB-C to USB cable. My small Time Machine drive for the old MacBook Air uses a miniUSB to USB connector. Chaining those together, I was able to mount my external OWC hard disk (which requires external power anyway) on the MacBook. So using a Flash drive or a small hard disk as a Time Machine drive will be a no brainer for me. 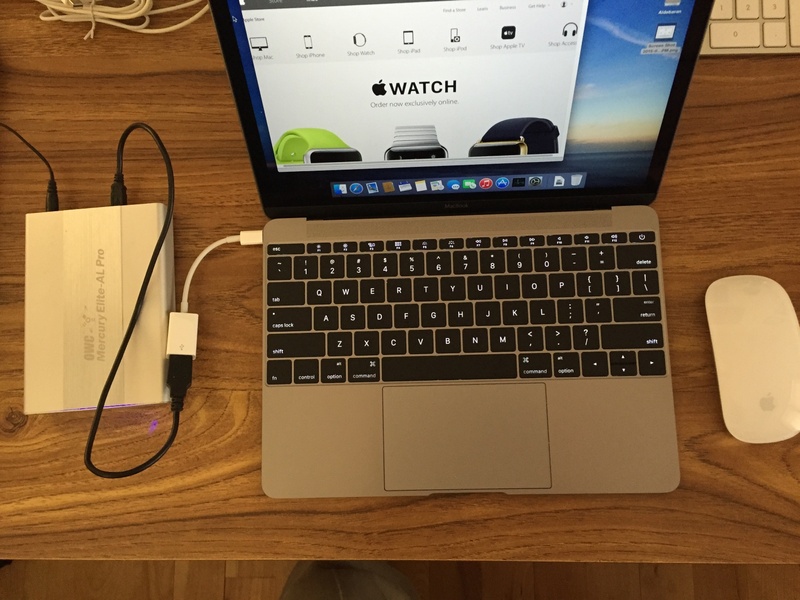 MacBook > USB-C > USB > miniUSB > hard disk. SImple. When all my work is done, the MacBook with its 9 hour battery life, can finally be connected to the charger overnight. There isn't any strong urge to have the MacBook plugged into power when I'm working with it, and it that sense it acts more like an iPad than a MacBook of old. I think that's no design accident. After some very brief initial testing, I am realizing that this MacBook is very specific in its design language. It spoke to me about how it wants to be used, and that required a shift in mental gears. But that's what we always do when we move forward. it's fun. Perhaps it's good that the USB-C docks are slow in coming. I'll probably get one or two for review, but I doubt I'll need it as much as I thought way back when this MacBook was announced. Hey, MacBook. Talk to me more. I'm listening.